John Coleman – Performance Coach with the National Para-Alpine team and National Ringette team. Winner of Elk Beaver 100km on Vancouver Island , setting an unofficial world trail 100km record. Kat Feeney – Nutritionist at NuRoots, Canmore. John and Ellie will combine their experience of maintain motivation from the psychological and physiological aspect. John will focus on the 3M's that matter; meaning matters: “What is the meaning behind what you do? Why are you doing what you do and or why are you interested in starting something new?” Momentum matters: The question isn't “am I contributing to my momentum”, it is “how am I contributing to my momentum”. And the next question is “what momentum am I contributing to?” Moment matters: John will talk about the importance of being present in the moment when deciding to be motivated. Ellie will speak about how she stays motivated during the cold winter months in order to get enough mileage in to remain competitive in the spring. Ellie will touch on the importance of goal setting (both short and long term), discuss a healthy training routine and talk about how the balance between being tough on yourself and also knowing when to step back can keep you motivated. Kat will focus on seasonal whole foods and strengthening immunity. She will also be providing a list of recipes for you all to take home. The floor will then be opened to discussion. 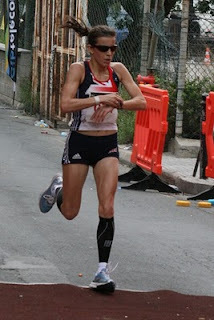 Just before I headed off to Gibraltar for the World 100km Championships I read Devon Crosby-Helms blog about her course record setting win at the USATF 50 mile champs at Tussey Mountainback where she had a perfect race; everything came together and she ran strong and fast and felt great throughout the race. It reads like a runners dream. It would be fair to say that I didn't have a 'Devon-day' at Gibraltar but this was a race that I had logged several 140 mile weeks for and many more 100 mile plus weeks, it was my first time I was proudly wearing Team GB kit and I wasn't going to give up without a fight. I flew to the UK about a week before the race. I chilled with family and focused on having fun, getting over jet lag and going on a couple of easy runs to spin the legs out. Early Friday morning Team GB assembled at London's Heathrow airport and a few short hours later we touched down in Gibraltar and made our way to our floating Athletes Village, a cruise ship, our home for the next 3 nights. That afternoon our whole team headed out to recce the course and stretch the legs. Although on a map it looked like a pretty straight forward course (few wiggles around before hitting 19 x 5km loops) we soon saw that it was some tight twists and turns, uneven surfaces in the docks area and some hills which would be sure to take their toll by the 19th time we hit them. I think everyone adjusted their predicted pace after seeing the course. Saturday passed quickly, last minute preps of bottles and food, a team meeting to go over the finer details of race rules and organisation and lots of carb loading at the buffet meals provided on the cruise ship. Like someone said, I think the ship's crew were rather bemused that such a slim looking bunch of people could consume so much food! I'd had my usual niggling hamstring pains and was rather concerned that despite a 2 week taper they were still bugging me more than I would like. I therefore decided to risk putting myself in the hands of our Team GB physio David and was glad that I did so as after some stretches and ultrasound my legs felt much better. The opening ceremony on Saturday evening was a great chance to properly see all the other countries represented and catch a glimpse of the other racers, but after the lively ceremony we all headed back to the ship for an early and eerily quiet dinner before hitting bed by just after 9pm. I don't think neither I nor my cabin-mate Emily (Gelder, 2010 spartathlon winner) really needed our alarms as we were eagerly out of bed my 4.30am quick breakfast, throw on the kit and by 5am we were wondering what to do for the next 1.5hrs other than pose for silly photos in our GB kit in the small cabin. By 6am we were off the ship and walked the few hundred metres to the race start line. It was still dark (and would be for the first hour or so of the race) and it looked like it was perfect racing conditions, mild yet overcast. 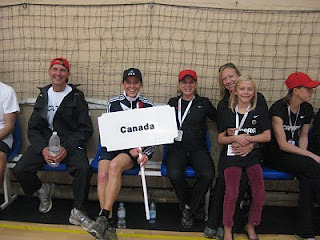 Soon the race was off and I almost immediately settled beside by GB team mate and 2006 World 100km champ Lizzy Hawker. With not being allowed to race with a garmin and there being no km markers until 10km we had to go by feel for our pace. All was going well until the lead bike faltered on which direction to take and suddenly all racers had stopped and we were standing in the street shouting for directions. Someone took the lead and we were off again, I suspected in the wrong direction but we then got back on course and I held my pace back as others rushed off at a much increased pace in mild panic. After the initial twists and turns we then moved onto the main 5.06km loop which we were to complete 19 times. The first few loops were good to preview and assess how to tackle each part of the loop and I was feeling calm and strong. I soon needed to hit a pit-stop and after not spotting the port-loos on one loop I then found them on the next loop and nipped inside leaving Lizzy to carry on ahead. My mum, dad, sister, brother-in-law, neice and aunt were all there to cheer me on and after a few loops I was glad to be able to check with them as to how many loops I had done as I was already losing count by the sixth! I was so focused on trying to track my splits per loop that I couldn't count the loops too. I aimed to run about 22mins per loop which would be approx 44min/ 10km and a 7h20 finishing time. Initially Lizzy and I went faster than this so in a way I was glad of my pit stop as this meant Lizzy and I were no longer running side by side as I feared if we carried on that way we would run each other into the ground and both blow up early. I focused on taking on fuel from the start. At the start/ finish of each loop each country had a feeding station set up where I was grabbing gatorade and Clif shot blocks, whilst leaving picking up plain water from aid stations out on the loops. It was great to come into the start/ finish area as I had not only my family cheering me on but also the Team Canada crew! I rolled past the marathon mark in about 3h02, this I thought was ok - fast but not crazy fast. However I was already getting a little concerned by how much I was feeling my hamstrings. I know I can run on mashed hamstrings but was worried whether I could run 55 more road kms in the state they were feeling already. It was around the 50km mark (about 3h34) that I shouted out to Team GB crew as I rolled through one more loop, 'my hamstrings are shot'. I was preparing them for the fact that I might need help by the end of the next loop. So it was at about 55km that I made my first stop at the feeding station, on all others so far I had grabbed a bottle or Clif shot blocks on the move. David immediatly had the physio table up and before I knew it his elbow was working wonders on my hamstrings as I downed a couple of paracetemol with gatorade. I got up off the physio table and was back running. I knew I had lost time but knew it was unavoidable, without David's elbow working it's magic my race would have been over, at least now even if I had lost maybe 5mins I was still on the race course. My hamstrings felt much better but my legs felt just plain heavy. I had not forseen this being an easy race but I was scared by how tough it was feeling already. I still had about 45km to go and I was seriously considering dropping. My pace had slowed, my legs felt awful and I knew that one day my racing streak would come to an end but so didn't want it to be here at the World Championships. A French coach had been calling my splits behing Lizzy (rather kind if rather odd) and now it got to 5mins I said 'Merci Monsieur France but don't bother now' and I could tell he agreed, I was clearly not looking strong. Here I decided on a few things - 1) I couldn't drop so early, I at least had to go a decent distance, 2) the wheels were falling off but they were still attached by a tiny strand of dental floss and I was going to use that dental floss to get them fixed back on more securely, 3) I was going to crawl to the finish even if if took over 9 hours, we only had 3 women on our team so all needed to finish to be in contention for a team medal, I wasn't going to let Emily and Lizzy down as both of them still looked strong, 4) I never want to run 100km on tarmac again so I better finish it this time as otherwise I'll have unfinished business and will need to run 100km on tarmac again, 5) this is crazy as I really never want to run this again but I may change my mind and if so I won't get on Team GB again if I look like a pansy trail runner who drops when the going gets tough on roads, 7) Three team GB guys have already dropped, Team GB are going to look right flaky if I drop too (note guys - this is no criticism to you, I know you were all ill & ailing! ), 8) my friend Jackie is the toughest coookie I know who completed her first crazy hard 100 miler in 42hrs, Jackie must have felt way worse and I'll do this for her. So off I was again running and with far happier hamstrings but still feeling awful and with all these thoughts whirring in and out of my head. I was going through ups and downs and can so clearly remember thining '7 more loops, I can do that' but then I got the 6 more loops to go and just had a melt down on team GB crew. Suddenly 6 more loops seemed unfathomable. I would feel ok coming into the feeding station but within a few hundred metres of leaving I was wondering how I would get around the the next 5km. So I split it down; they had shortened one loop due to our wrong turn at the start and Norman Wilson of IAU/ Team GB was directing runners onto the short loop so now I was running from the feeding station to Norman, then onto the BP gas station where a local was cheering me on, 'C'mon GB, lookin' great darlin'' ( this was a blatant if well intended lie on his part, I was looking deathly). I had given up all hope of winning or even placing well and was just doing this for the team. On leaving the feeding station with 6 loops to go I knew I would be ok if I got the 4 loops to go and I knew that 6 loops/ 30km was the same distance as one of my standard evening run routes in Banff. I thought of all the times I had run the Lake Minnewanka 27km loop exhausted after work, if I could do that then then I could do it now at the World Championships. With 3 loops to go I stopped at the feeding station again, I needed some chips as I had gone off my Clif Shots. I was munching away on my Walkers salt & vinegars when Andy said, 'You're only seconds back from 2nd place Ellie, and the longer the your spend eating those chips, the more time you have to catch up'. That was it, I was out of that station ...without even saying to Andy that I had thought I was in 2nd already. Monsieur France was as stunned as I was by my second wind and began calling rather more optimistic splits. On entering the penultimate loop Norman who was standing on the side of the course casually said, 'You can catch them Ellie', to which I calmly replied, 'I know I can'. I picked up the pace a little more and began searching for an Italian singlet and Lizzy in the crowd of runners looping the loop. With about 7km to go I saw both Monica Carlin and Lizzy. For a millisecond I contemplated sitting behind Monica quietly but I knew I had no time for that so I floated past her and less than a minute latter I passed Lizzy with the words, 'She's on my heels, we need to go now'. I knew from Lizzy's sigh that she was struggling to pick up the pace but I didn't dare look back to see if Monica was following. I just ploughed on and came into the start/ finish with one loop to go and I was in 1st place at the World Championships! I so didn't want this to come to a sprint finish so I focused on extending my lead and praying that my now painful quads would hold for just 5 more km. As I hit the uphill out of the dock area I thought back to pushing the final hills in Chuckanut with Ryne of Montrail urging me, and as I got to about 1km to go I ditched my coke bottle and went for it. I had to take a corner wide around a slower runner I was lapping and the thought crossed my mind that I would be so annoyed if taking that corner wide meant Monica caught me! But I needn't have worried, I crossed the finish line in 7:29:05, about 90 seconds ahead of Monica, and with Lizzy a couple of minuted back of her. 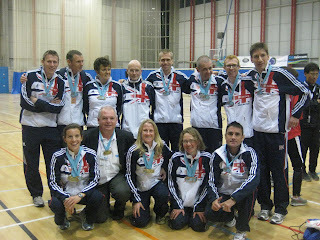 - Thank you to Team GB - it was a real plaeasure to meet you all and race with you. Look forward to seeing you at many more races to come! Congrats to us ladies for World Team Gold and to the gents for European Team bronze. Woo hoo! - Thank you to 'Lookin' Good Darlin' BP gas station-guy. I really meant it when I said you kept me going. - Walking down stairs sideways can be an alternative when going forwards or backwards is not option post-race.